Today the media concentrates it’s efforts on plunging the user into ever more realistic sensory experiences. The experience is called engaging when all the senses of the user are solicited in order to create an emotional momentum that guarantees the users attention. 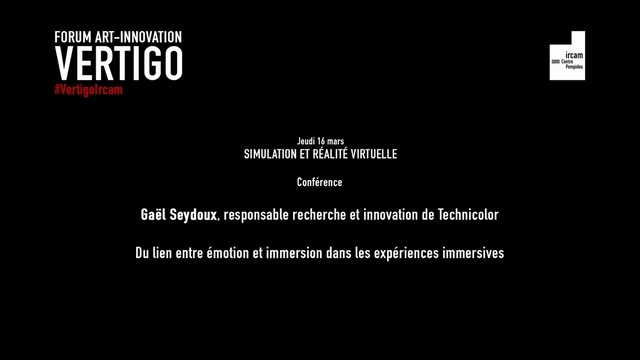 From the representation of the human being in 3D (avatar) and its use in immersive experiences (3C rule: character, control, camera), an emotional connection between the universe of experience and the user is formed. From video games to virtual reality worlds, the notions of "embodiment", control and commitment and how technologies (light field, parallax and immersive format, virtual reality, multi user and collaboration) experience makes this new media plausible will be tackled.